Conventionally sprung mattress with conventional padding and cotton cover. A good quality standard sprung mattress, constructed from conventional springs all connected together into a rectangular matrix made to measure for your particular bed. The springs are 3" in diameter, resulting in a spring density of 16 springs per sq foot. 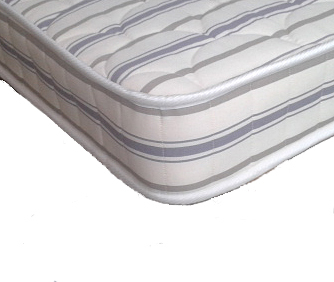 The spring matrix is then covered top and bottom in conventional cotton padding and then covered in a cream and blue striped quilted cotton cover. We have had one or two mistakes with customers specifying mattress sizes to fit thier beds, so if you just want the mattress to fit the bed you have ordered, leave the drop down boxes as 'to fit'. If you are just after a mattress, select the size of mattress you require from the drop down boxes. We do not hold mattresses in stock. Mattresses are made up to order and therefore delivery can take 2-3 weeks from time of order even if you only order a mattress. Click on 'Add to basket' to add your mattress to your order.